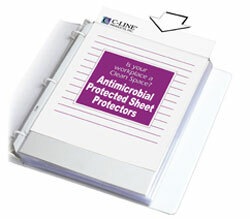 This heavyweight, polypropylene magazine cover has built-in antimicrobial protection. Antimicrobial protection helps prevent the growth of stain causing bacteria, yeasts, molds, and fungi. Acid-free poly won't lift print. Fits all standard size magazines. Ideal for libraries, doctor's offices, medical facilities as well as commercial uses. Triclosan-free. 25/BX.